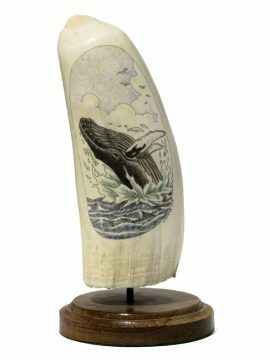 “Schooner Anne R. Lewis” black and white scrimshaw on ancient walrus tusk ivory artifact by Gerry Dupont. Excellent composition and choice of subject matter for this shape of ivory. The schooner fits perfectly. Unusual artifact, narrow with pointed tip, probably used as some type of needle by ancient people hundreds of years ago. Great value on this one.